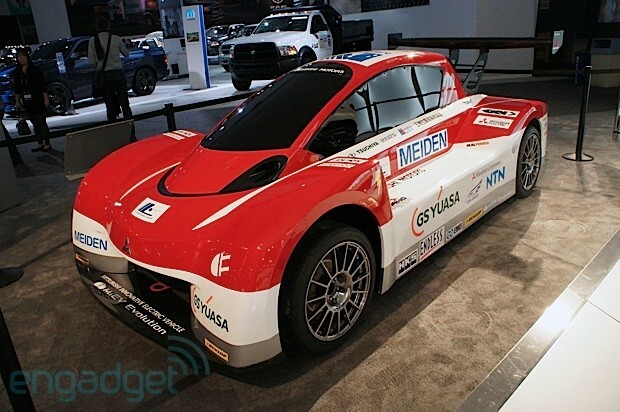 Many automakers are testing the waters by introducing all-electric vehicles to consumers at this year's LA Auto Show, but Mitsubishi's i-MiEV Evolution aims to stomp with the big dogs in the world of competitive racing. Taking second place at this year's Pikes Peak International Hill Climb, this juiced up carbon-fiber speedster pushes around 322HP from its three 80KW electric motors and packs a 35KWh lithium-ion battery. While it seems the Evo should be chasing after the Mach 5 and it looks like it came from Pops Racer's garage, many of its components come from its predecessor, with the exception of its all-wheel drive configuration. Speed past the break to get a closer look at this battery-powered brute in all of its manga inspired glory.